Last week we informed you that Huawei is planning to expand its smartphone portfolio in India with the launch of the Huawei Ascend Y200 and G300. And today, Huawei has announced the launch of both the Android 2.3 Gingerbread running smartphones in India with a decent price tag. Huawei Ascend Y200 has Stylish “U” form design with premium looks and 3D texture on back for firm grip. It takes only 5 seconds to boot up and takes only 90 minutes to get fully charged with a high power charger. The Ascend Y200 arrives with Dual-Mic which reduces the background noise, giving users good calling experience. The Y200 is priced at Rs. 8190 for India users to get their hands on the device. Next up is the Ascend G300 which arrives with a 4.0-inch WVGA IPS hard screen technology with anti figure print design which supports auto-rotation to optimize media viewing and Internet browsing. In addition, an ambient light sensor allows the user to see the screen and view media uninterrupted in any lighting environment. Ascend G300 arrives with a 1350 mAh battery and it takes less than 120 minutes to get fully charged with a high power charger. 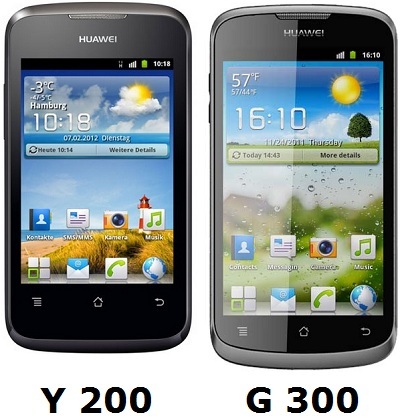 Huawei has decided to sell the G300 for a price of Rs. 13,490 in India.